"Chihuahuas - the smallest breed of dog in the world. Named after the state of Chihuahua in Mexico." If you watch television, you've probably seen celebrities like Paris Hilton toting around tiny dogs with big poppy brown eyes. These dogs, called Chihuahuas, are one of the smallest dog breeds in the world. The Chihuahua first appeared in Mexico. It was discovered in 1850 and does well in warmer climates. Of course, a doggy sweater can make one of these small dogs feel warm and cozy during winter months. They have prick ears, an alert expression, and big, slightly poppy eyes. This breed has both short haired and long haired varieties. They were bred to be companion dogs and they excel at this task. They hate to be alone and thrives when it is in the thick of things. Chihuahuas are prized for their devotion, ferocity and personality. Their curious nature and small size make them easily adaptable to a variety of environments, including the city and small apartments. They are ideal apartment dogs, since they do not take up much room and do not need a ton of exercise. Some people even train these little guys to use a litter box. This doesn't mean that a Chihuahua won't enjoy living in a house with a yard, though! This breed enjoys exercising and playing outdoors on warm days. They also tends to be bossy and easily spoiled, especially if the dog's owners allow it to get away with aggressive or angry behaviors. "If you have other dogs, you will need to be sure that your Chihuahua does not bully them!" Because they have a tendency to be self centered and badly behaved, Chihuahuas should receive puppy obedience training. After all, even a tiny tyrant can be unpleasant to be around. 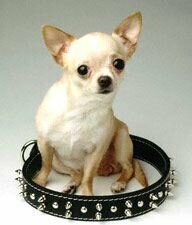 Chihuahuas eat very little, but feeding costs can still be a bit high, since these dogs are often picky eaters. Also, this breed is so delicate that some dogs have trouble eating hard, dry food. Care must be taken to provide them with adequate nutrition. At the same time, care must be exercised not to overfeed this tiny breed. Over feeding a Chihuahua can be very dangerous to this small dog's health. It can shortening their life, leading to diabetes. Chihuahuas are also known for their moleras, a soft spot in their skulls. They are the only breed of dog to be born with an incomplete skull. The molera does fill in with age, but great care needs to be taken during the first six months until the skull is fully formed. 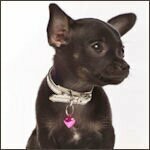 Many veterinarians are not familiar with Chihuahuas as a breed, and mistakenly confuse a molera with hydrocephalus. 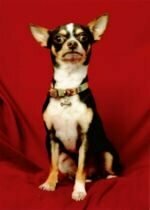 The Chihuahua Club of America has issued a statement regarding this often deadly misdiagnosis. Chihuahuas have a Tendency to Tremble. This is not a health issue, rather it takes place when the dog is stressed or excited. One reason for this may be because small dogs have a higher metabolism than larger dogs and therefore dissipate heat faster. 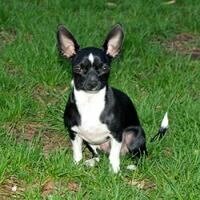 Overweight Chihuahuas are prone to joint injuries, tracheal collapse, chronic bronchitis, and shortened life span. Is the Chihuahua for you? Chihuahuas are often stereotyped as high-strung, though it has been shown that correct training and socialization can result in an outstanding companion animal. 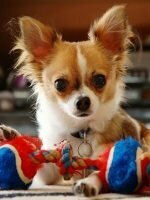 Dog Breed Family The American Kennel Club considers Chihuahuas to be part of the Toy Group. 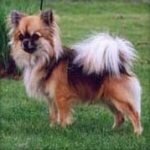 Some academics believe the Chihuahua to be descended from Chinese hairless dogswho may have crossed over from Asia to Alaska on a land bridge before continental separation created the Bering Straitand bred with the ancient Toltec and Aztec Techichi dog, creating the modern-day Chihuahua. Senator Rogers Kelley, of Edinburgh, Texas, was so enamoured of the Chihuahua that he proposed in 1948 to introduce a resolution at a session of the State Legislature to make the Chihuahua the official dog of Texas. Said the senator: "Sure it came from Mexico, but so did Texas". 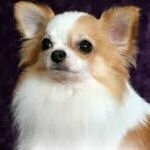 The Chihuahua is considered to be the only breed of domesticated dog truly indigenous to the American continent.